On the day that Mirus celebrates 10 years in business, it has also been awarded with the CompTIA IT Business Trustmark – the first of 5 organisations worldwide to achieve the award. 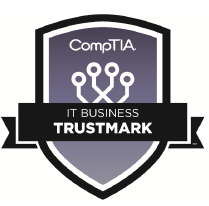 The CompTIA IT Business Trustmark is a business credential designed to validate an IT business in its ability to demonstrate sound business practices and provide quality service by adhering to a number of business and technology best practices. The purpose of the CompTIA IT Business Trustmark programme is two-fold. Firstly, it is designed to establish a baseline of the organisational skills, policies and procedures required to operate an IT business. Secondly, the programme is designed with a firm eye on educating the industry. Foundational courses, virtual and live education, and self-help guides such as this manual support the control framework and raise the acumen of the average IT service provider. Organisations that perform to this standard set themselves apart from the competition, with the credential creating a differentiator. CompTIA is the voice of the world's information technology (IT) industry. As a non-profit trade association advancing the global interests of IT professionals and companies, we focus our programs on four main areas: education, certification, advocacy, and philanthropy.